Formwork by name means “The Mold” which means it is the casing into which the casting material, usually concrete, is poured to obtain the desired structural shape. 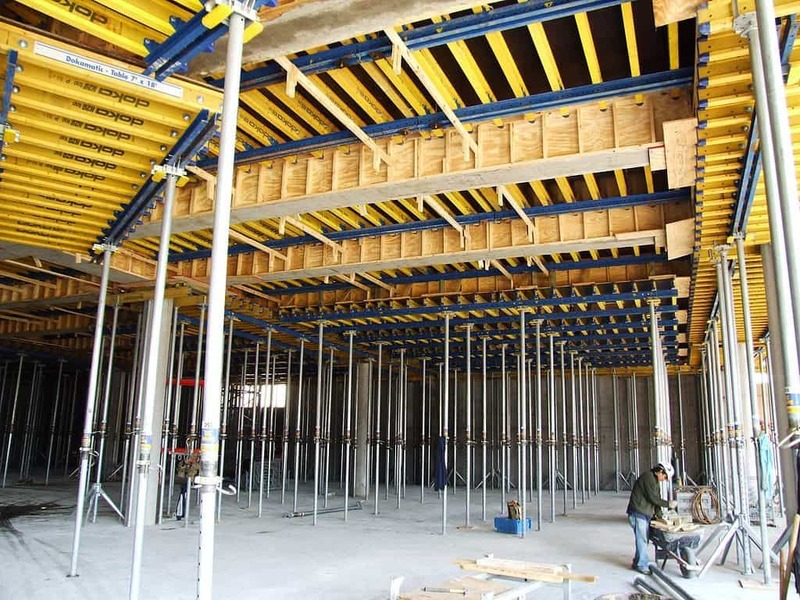 In construction industry formwork is similar to a mold to cast concrete member in different shape and sizes using different types of materials such as timber, steel, aluminum, plastic, etc. Shuttering is a synonym term used for form-work. Form work should have sufficient strength to carry dead load and live load coming on it during casting operation and after that till concrete gets hard and gain some percentage of design strength. Timber Shuttering is easy to construct for any shape, size and height. It is economical for Small projects. It can easily be made into any shape or size. It can be constructed using locally available timber. It is light weight as compared to steel or aluminum Shuttering. Plywood is an artificially manufactured wooden material available in different thickness and size used in formwork for concrete member. It is strong enough, durable and light weight. Plywood is one of the mostly used materials for sheathing, decking and form linings in shuttering. Steel formwork is now becoming popular due to its long life time and multiple time reuses. Steel formwork is costly but can be used for large number of projects. Steel shuttering give very smooth finishes to concrete surface. It is suitable for circular or curved structures such as tanks, columns, chimneys, sewer, tunnel and retaining wall. Steel shuttering is strong, durable & has longer life. It gives very smooth finish to surface of member. It is waterproof and minimizes the honeycombing effect. Steel formwork can be installed & dismantled with greater ease. 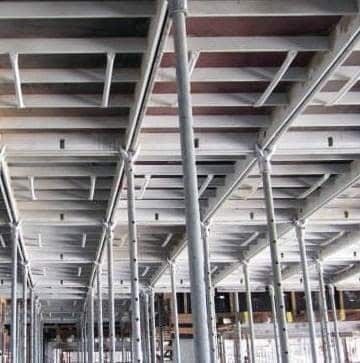 Aluminum formwork is similar in many respects similar to those made of steel. Aluminum forms are lighter than steel forms due to low density and this is their primary advantage when compared to steel. The shuttering is economical if large numbers of repeating usage are made in construction. The disadvantage is that no alteration is possible once the formwork is constructed. Plastic form work is a lightweight modular, interlocking system and can be used more than 100 times. It can be used for simple concrete structures. This type of shuttering is becoming popular for similar shape and large housing scheme. It is light weight shuttering hence requires less handling cost. It can be used for large section. If carefully transported and used, multiple reuses are possible making it highly economical. Fabric formwork is emerging technology in shuttering industry for construction of irregular shape and complex member. The flexibility of this material makes it possible to produce concrete at any shape. 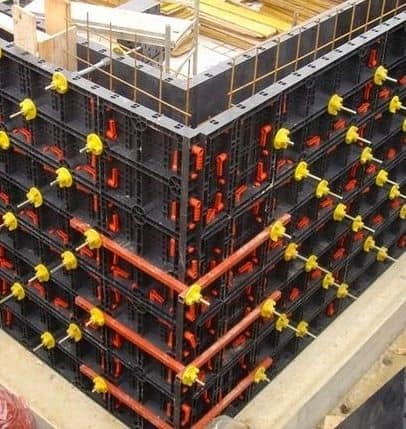 Coffor is a stay in place formwork system. It is composed of two filtering grids which is reinforced by vertical stiffeners and linked by articulated connectors which can be folded to transport on site. Coffor remains in place after concrete is poured and acts as reinforcement. Coffor is transported to the site prefabricated from the factory. This type of shuttering can be used for any type of structure like houses, multistory buildings etc. 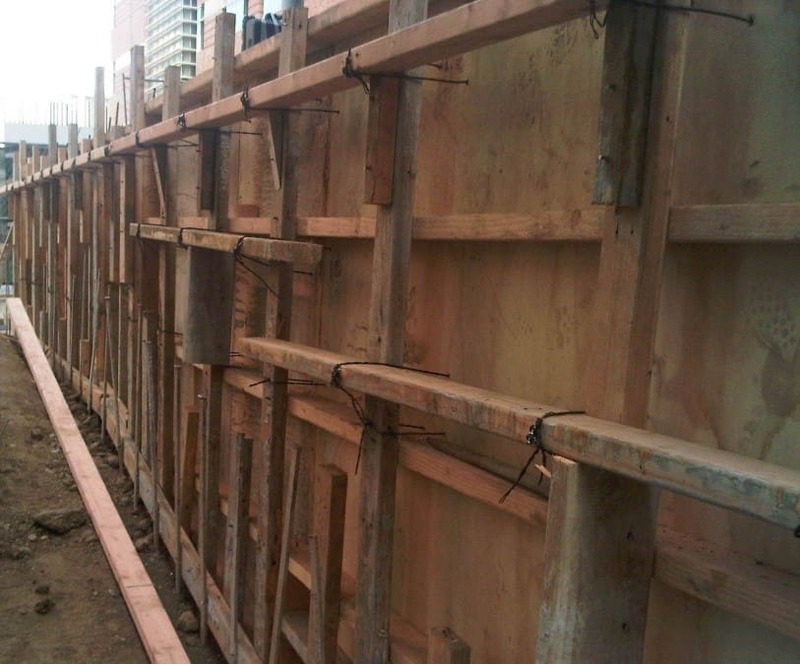 Wall formwork used for concreting of shear or RCC wall in dams, wing walls, basement rcc walls etc. Wall shuttering made up of vertically arranged upright timbers (bearers) to which plywood sheeting boards are nailed at the inner side. The upright timbers are diagonally braced with the help of boards at both sides. Beam is the most important member in RCC framed structure. Beam formwork has prefabricated form work includes sheeting bottom and side sheeting panels. The individual parts of form-work are manufactured based on the beam size. For prefabrication of the sheeting parts, a table for fabrication must be manufactured on site. Foundation formworks designed according to foundation type. 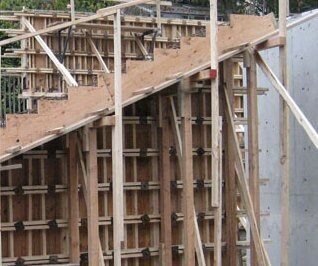 Shuttering design for foundation depends on foundation type like footing, combined footing, raft. Basically there is a difference in the design for individual foundations, and shuttering for strip foundations. 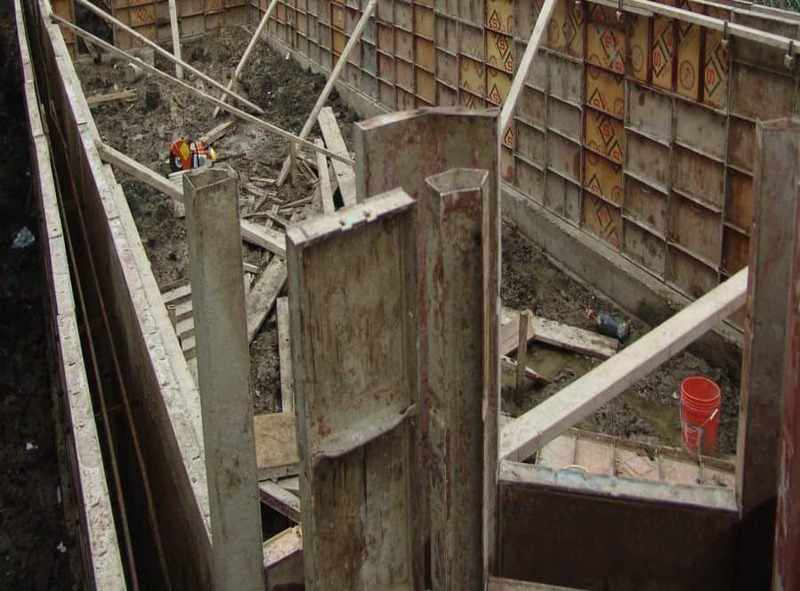 The design of shuttering is dictated by the size, mainly by the height of the foundation. Formwork arrangement for column may differ on the basis of column outline like rectangular, circular, and hexagonal or any other shape. The sheeting of column shuttering is constructed according to the column dimensions. The panels are placed in a foot rim, anchored in soil with the help of bolts.